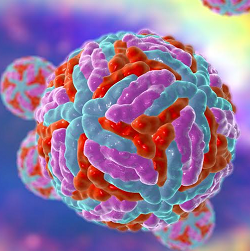 ZIKA virus is presently causing significant worldwide concern due its rapid spread across the globe and suggested connection to a neurological birth disorder. The outbreak began in Brazil in 2015 and has since spread throughout South and Central America, and is thought likely to reach most of the Americas by the end of 2016. The disease is primarily spread by mosquito, although transmission between people through sexual contact or blood transfusion is also possible. The spread of the virus presents an urgent medical need for rapid Zika virus (ZIKV) diagnostic assays to be developed. As a step towards this, Amsbio has announced a new range of recombinant antigens and antibodies for Zika. It says these are suited to the development of rapid assays, and overcome the problem of cross-reactivity with related viruses. ZIKV is closely related to other mosquito-borne flaviviruses, and existing tests such as PCR assays and antibody (IgM/IgG) detection assays may have difficulty differentiating them. Another obstacle is that PCR assays are only able to directly test for the presence of ZIKV up to five days after onset of symptoms, says Amsbio. After this, the virus is no longer detectable by this method. Recombinant antigens of envelope and NS1 proteins show promise as a strategy to overcome the problem of flavivirus cross-reactivity with the closely related viruses, the company adds. IgG and IgM antibodies show high sensitivity and specificity to these epitopes, especially NS1 which is thought to contain more species-specific epitopes than the envelope proteins. By including unconjugated Dengue antigens in low concentration, it is possible to block antibodies that are highly cross-reactive between various flaviviruses. Amsbio has released two new recombinant antigens which it says are ideal for the development of a specific rapid IgG/IgM antibody detection assay. These are available in 1mg size for evaluation and gram bulk quantities for diagnostic assay development. These recombinant antigens are expected to have the necessary post-translational modifications (such as glycosylation) needed for proper folding. With the opening of the 2016 Olympic Games in Brazil now imminent, the need to screen large numbers of samples in the field is likely to be very high.